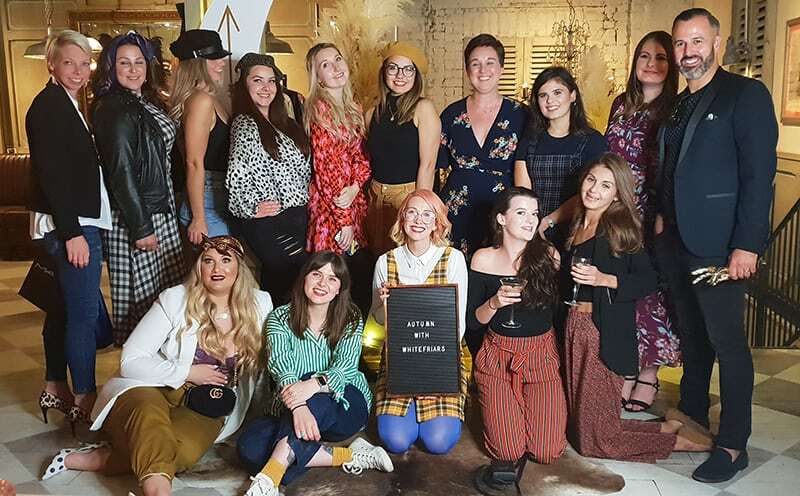 Whitefriars welcomed the Autumn in style at its first ever bloggers and influencers event on Friday, 14 September at Bill’s Restaurant in Canterbury. The guest list was made up of local bloggers, award-winning influencers and Kent publishers who were able to preview key autumnal pieces from a number of Whitefriars fashion stores, including River Island, Karen Millen and Next. The evening was a great success and guests were able to enjoy makeup demonstrations from MAC cosmetics, dinner and cocktail making courtesy of Bill’s Restaurant and a style talk from colourful style influencer and writer Siobhan – Just a Uniform. On arrival guests were greeted with a glass of prosecco and a mouthwatering selection of nibbles from Bill’s new Autumn menu before browsing the hottest picks from the stores. There were a number of photo opportunities throughout the evening and props included a large moon backdrop from Hire Love, where guests enjoyed posing for polaroid pictures with Jessops, whose staff were on hand to share expert advice on the best cameras for creating content on the go. The professional makeup artists from Fenwick’s MAC Cosmetics set up a station and offered advice and tips for flawless makeup, colour matching the guests against their range of products. They didn’t leave the guests empty handed and shared with them some amazing gifts including the much-loved mini MAC lipstick and a complimentary makeup session. Later in the evening, guests were invited to take their seat to enjoy a delicious main meal courtesy of Bill’s Restaurant. Popular items from the new Autumn menu included Macaroni Cheese, Ancient Grain Bowls and Thai Green Chicken Curry. The dinner was followed by cocktail making which gave the guests a chance to shake things up and make their own espresso martinis. The highlight of the evening was a talk and Q&A from guest stylist Siobhan who runs the online blog ‘Just a Uniform’. The talk showcased some of the key autumnal trends which could be found in Whitefriars along with some outfits that Siobhan herself had put together from the stores for the evening. Jaide Poppy, writer of blog ‘That’s just me!’, said: “Thank you so much for a brilliant night, already looking forward to the next one!”. Whitefriars Marketing Manager Julie Holness adds: “The feedback from the evening has been incredible. Not only did the guests enjoy exploring the season’s new trends but they were able to network and meet other local bloggers in the area. All guests left with amazing goody bags which were full to the brim with samples and products from Whitefriars’ stores and other local businesses. View and download photos of the event here. Final call for your back to school essentials!